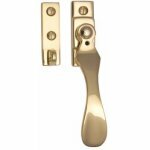 Solid brass locking wedge pattern casement window fastener, suitable for standard windows or weather stripped windows. Length 127mm. 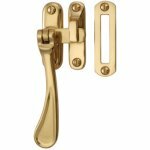 Available in Polished Brass, Satin Brass, Polished Chrome, Satin Chrome, Antique Brass, Satin Nickel & Polished Nickel. 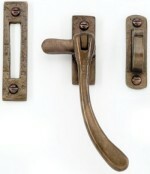 Antique brass finish solid brass bulb bend casement window fastener with a mortice plate and hook. 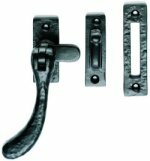 Ludlow Foundries black iron casement fastener, supplied with hook and mortice plates. Back plate size 60mm x 23mm. 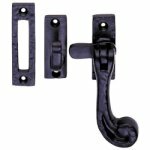 Ludlow Foundries black iron curly tail casement fastener, supplied with hook and mortice plates. Back plate size 60mm x 23mm. 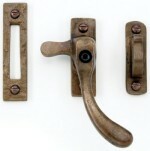 Ludlow Foundries black iron bulb end casement fastener, supplied with hook and mortice plates. Back plate size 58mm x 24mm. Ludlow Foundries black iron locking wedge type casement fastener, backplate size 57mm x 20mm. 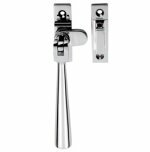 Available in left hand and right hand sets, picture shows a left hand set. 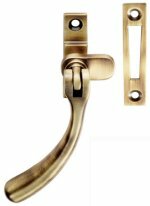 Foxcote Foundries black iron curly tail casement window fastener. Manufactured from malleable iron using an annealing heat treatment process for a high quality product that offers a durable, functional and highly decorative finish on your windows. 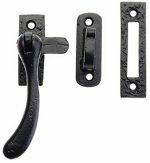 Foxcote Foundries black iron bulb end casement window fastener. Manufactured from malleable iron using an annealing heat treatment process for a high quality product that offers a durable, functional and highly decorative finish on your windows. From The Anvil antique pewter peardrop window fastener. 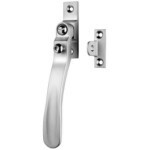 The fastener is reversible so it can be used on either left or right handed windows. 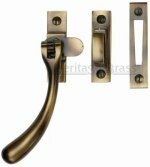 Handle length 95mm, fixing plate 60mm x 19mm, mortice plate 76mm x 19mm. From The Anvil pewter monkeytail window fastener forged from steel, reversible (not handed) and can be fitted to either the left or the right side of the window. It is also suitable for use on windows that have a draft seal. 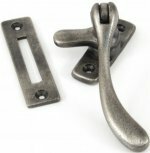 Oil rubbed solid bronze bulb end casement window fastener. Supplied with a mortice plate fastener or hook plate fastener. 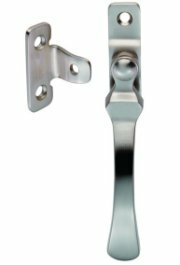 Satin stainless steel window casement fastener complete with flat keep and hook plate. 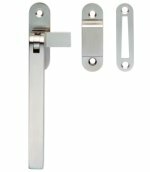 Satin stainless steel square casement window fastener complete with flat keep and hook plate. 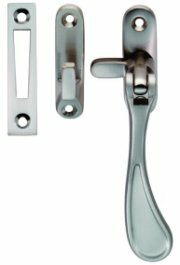 Satin nickel reversible casement window fastener complete with hook and mortice fitting plates. Backplate size 57mm x 13mm. 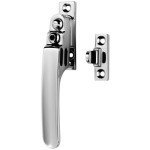 Satin nickel bulb end casement window fastener complete with hook and mortice plate, suitable for standard windows or weather stripped windows. 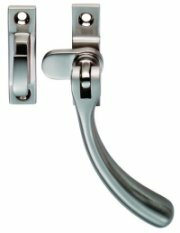 Satin nickel locking wedge type window casement fastener. Backplate size 57mm x 13mm.